I have finally decided to call this cursor set finished, otherwise you guys will never see anything from me. I hope you like it. This one goes to all those Star Wars fans out there! Oh and credits... Thanks go to scifi3d.theforce.net for supplying incredible 3D models! Miniature 3d models. Sweet. And clean. The Busy, Crosshair and Unavailable are nice. I love watching the fighter get destroyed in a flash. NIce work Tom And well worth the wait. I found the resizers a little work to get used to, but that is a personal preference and no reflection on quality. And im sure my own sets have done the same to others. I set my hotspots to where I feel comfortable and hope most people can live with it too. Soooo... this is great . Not just great for a 1st cursor, great even for a hundreth cursor. RECC, I'll see if I can do some flame stuff, the problem is I cannot edit my PNGs in PaintShopPro, it messes them up. I'll find a way though. Oh and... Any suggestions for the next set? More Star Wars? or something different maybe? Oh and hotspots for the resize cursors: I guess you could move it to the wing area or center of body. Whatever floats your boat, or space ship for that matter. Woooooaaahhh! Is this really your first! Sweeeet! I think we've got a new CursorXP Star here! We can add you to the list of Ingui and Shmoopy! Gosh, this reeeaaallly creative Tombala, very good work! Keep it up. Very nice, It would be nice if the standard pointer would be animated...just a suggestion. The resizers did take a little getting used to.With the ship as the cursor I would have expected a little more out of the working state. Thanks Rad, ptrcstn, WOM... I know it is not all very creative animations but I just get bored after a while... I was just happy to finally finish a cursor set and be able to post it here! So no suggestions for the next set? 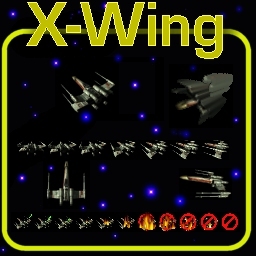 Im not a Battleship star wars person- but I'm using this cursor when I use my Space wallpapers. OMG! Tombala did it! And I missed this one I've been so busy! I LOOOOVE it! Okay, I realize that this is probibly a no brainer, but guess which cursor set I'll be using for a long time Someone made a cursor set that appears to made just for me!!! *hee-hee* It looks great BTW, all fanatism aside. Hmmm, Dragons... I like dragons too... I'll just have to find a Dragon model to use. I'm sure there is one out there waiting for me.